Azores (Açores), or Western Islands, an archipelago in the Atlantic Ocean, belonging to the kingdom of Portugal. Pop. (1900) 256,291; area, 922 sq. 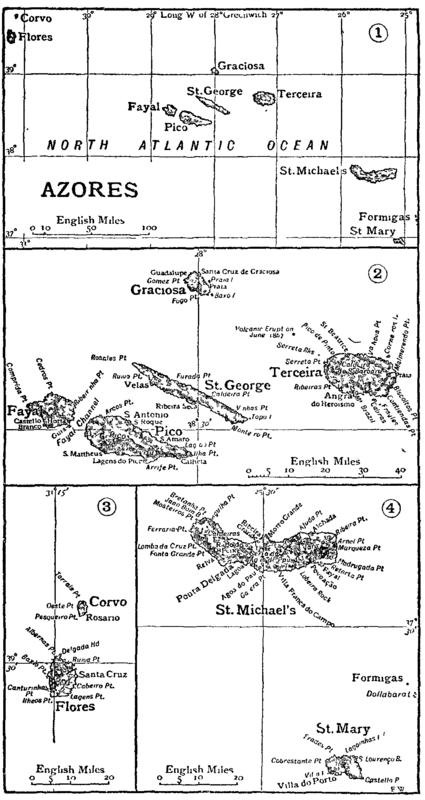 m. The Azores extend in an oblique line from N.W. to S.E., between 36° 55′ and 39° 55′ N., and between 25° and 31° 16′ W. They are divided into three widely severed groups, rising from a depth of more than 2&FRAC12; m. The south-eastern group consists of St Michael's (São Miguel) and St Mary (Santa Maria), with Formigas; the central, of Fayal (Faial), Pico, St George (São Jorge), Terceira and Graciosa; the north-western, of Flores and Corvo. The nearest continental land is Cape da Roca on the Portuguese coast, which lies 830 m. E. of St Michael's; while Cape Cantin, the nearest point on the African mainland, is more than 900 m. distant, and Cape Race in Newfoundland, the nearest American headland, is more than 1000 m. Thus the Azores are the farthest from any continent of all the island groups in the Atlantic; but they are usually regarded as belonging to Europe, as their climate and flora are European in character. The aspect of all the islands is very similar in general characteristics, presenting an elevated and undulating outline, with little or no tableland, and rising into peaks, of which the lowest, that of Corvo, is 350 ft., and the highest that of Pico, 7612 ft. above sea-level. The lines of sea-coast are, with few exceptions, high and precipitous, with bases of accumulated masses of fallen rock, in which open bays, or scarcely more enclosed inlets, form the harbours of the trading towns. The volcanic character of the whole archipelago is obvious, and has been abundantly confirmed by the numerous earthquakes and eruptions which have taken place since its discovery. Basalt and scoria are the chief erupted materials. Hitherto Flores, Corvo and Graciosa have been quite exempt, and Fayal has only suffered from one eruption (1672). The centre of activity has for the most part been St Michael's, while the neighbouring island of St Mary has altogether escaped. In 1444-1445 there was a great eruption at St Michael's, of which, however, the accounts that have been preserved exaggerate the importance. In 1522 the town of Villa Franca, at that time the capital of the island, was buried, with all its 6000 inhabitants, during a violent convulsion. In 1572 an eruption took place in Pico; in 1580 St George was the scene of numerous outbursts; and in 1614 a little town in Terceira was destroyed. In 1630, 1652, 1656, 1755, 1852, etc., St Michael's was visited with successive eruptions and earthquakes, several of them of great violence. On various occasions, as in 1638, 1720, 1811 and 1867, subterranean eruptions have taken place, which have sometimes been accompanied by the appearance of temporary islands. Of these the most remarkable was thrown up in June 1811, about half a league from the western extremity of St Michael's. It was called Sabrina by the commander of the British man-of-war of that name, who witnessed the phenomenon.